The Shop is open from 8am to 4pm we are usually in earlier. Why not take a break from shopping or your working day to enjoy a drink, a bite to eat (inside or out) and just watch Chichester walk by? 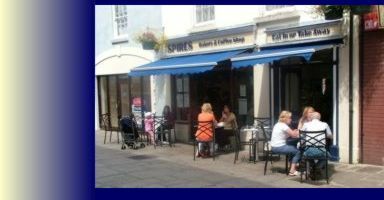 Welcome to Spires Bakery & Coffee Shop Established in 2005 we have been providing a wide selection of takeaway and eat in foods to the people of Chichester and visitors alike. We are small enough to care about the quality of our goods and pride ourselves with our customer service. Being independent allows us flexibility to meet your individual requirements. Feel free to pop into the shop and we will be pleased to help. Handmade sandwiches and rolls made in the shop everyday with deep fillings and a choice of breads. Try our homemade coleslaw or our free range egg mayo. A varied choice from our hot cupboard Including our own homemade pasties, tarts and quiches. Lincolnshire Pork sausage rolls one of our customer favourites. Oven baked potatoes, homemade soup and traditional cheese straws are baked throughout the day. Try Sue’s family recipe Bread Pudding and see Steve making scones in the shop, Cheese, Plain, The ’Big Fruit’ Ones, Stilton, Cheddar and Pickle, the list is lengthy. Indulge in a Cream Tea, Large homemade scone, clotted cream and strawberry jam! Hurry before they’ve all Scone! Order your takeaway Online! Now you can avoid the queues by ordering online for takeaway collection. Time to eat no time to queue. Order in advance and we will have your selection ready for you at the time you require all wrapped, priced and ready to go.